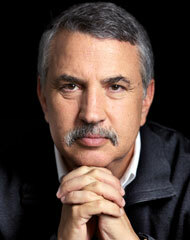 Op-Ed columnist Thomas L. Friedman in the New York Times. On the surface, this article is about the way political campaigns don't talk about real issues; get to the second paragraph, and his issue is straight to the point about Infrics.com era of you coverage. "The I.T. revolution is giving individuals more and more cheap tools of innovation, collaboration and creativity — thanks to hand-held computers, social networks and “the cloud,” which stores powerful applications that anyone can download. And the globalization side of this revolution is integrating more and more of these empowered people into ecosystems, where they can innovate and manufacture more products and services that make people’s lives more healthy, educated, entertained, productive and comfortable." The moral: bandwidth enables job creation. Tech power to the people.